Today is a very special day. Do you know what today is? It's Dorie Greenspan's birthday!!! That's right, the author of Baking: From My Home to Yours and Around My French Table: More Than 300 Recipes from My Home to Yours is celebrating her birthday today. What's more, she is spending part of the day with me! Well, truth be told she is not spending it with just little ole me. She is teaching a cooking class at Central Market here in Dallas, to help promote the release of her new book, Around My French Table: More Than 300 Recipes from My Home to Yours . I can't wait to finally meet her! Back in January of 2008 I came across a group of three bakers - Laurie and two other bloggers, who had decided to bake one recipe a week out of Baking: From My Home to Yours . Laurie called it Tuesdays with Dorie (TWD) because each week everyone posted their results on Tuesday. I had just purchased the book myself, and thought it would be the perfect way to motivate myself to actually use a cookbook. So I joined the group and now, nearly 3 years later, there are hundreds of others baking along. It only seemed natural, then, that with the release of her most recent book, French Fridays with Dorie (FFwD) was born. So, in honor of Dorie's birthday and the new blogging event French Fridays with Dorie, a few of us decided to get together and throw Dorie a "Surprise Birthday Party" using recipes from Around My French Table . Still, these biscuits were delicious. They had a great onion flavor without being too overwhelmingly onion-y (though I don't think there really is such a thing!). I think these would be great if you added some cheddar to them as well. Next time, I may try adding caramelized onions instead, too. I will definitely be making these again. I also think I'll be following Dorie's lead and make a batch to freeze and bake "on demand." Once the dough is cut, you can put the unbaked biscuits on a lined baking sheet, slide the sheet into the freezer and, once the rounds are solid, just pack them airtight. That way you can simply slide the frozen biscuits into the oven and bake them on a moment's notice. If you'd like the recipe, you can find it below. You'll have to get a copy of Around My French Table for most of the other recipes from this blogging event, but since this one can easily be found on Amazon I've posted it below. Make sure you visit Holly's blog, Phe.MOM.enon, to see what everyone else cooked up for Dorie's birthday. While you're here, if you haven't already entered, check out the giveaway I'm doing here. And of course a very big Happy Birthday to Dorie! I'm looking forward to meeting you this afternoon!!!!!!! Center a rack in the oven and preheat the oven to 425 degrees F. Have a biscuit or deep cookie cutter, one that’s between 1 and 2 inches in diameter, at hand. Put 1/2 tablespoon of the butter in a small skillet or saucepan and cut the remaining 6 tablespoons butter into 12 pieces. Set the pan over low heat, melt the butter, and add the onion. Cook, stirring, just until it softens, about 3 minutes. Pull the pan from the heat. Put the flour, baking powder, sugar, and salt into a mixing bowl and whisk the ingredients to combine. Drop the butter pieces into the bowl and, using your fingers, rub the butter into the flour mixture until you’ve got a bowl full of flour-covered pieces, some small and flakey and some the size of peas. Scatter the cooked onions over the mixture, then pour over the cold milk and, using a fork, toss and turn everything together until you’ve got a soft dough. If there are some dry bits at the bottom of the bowl, reach in and knead the dough gently a couple of times. Lightly dust a work surface with flour, turn the dough out, and dust the top of the dough very lightly with flour. Pat the dough down gently with your hands (or roll it out with a pin) until it is about 1/2 inch thick. It doesn’t have to been an even square or round; it doesn't even have to be an even 1/2 inch thick. Just do the best you can and do it quickly. Alternatively (and perhaps more economically), you can pat or roll out the dough, then, using a long knife, cut square biscuits, making each biscuit about 1- to 1-1/2 inches on a side. Bake the biscuits for 15 to 18 minutes, or until they are puffed and lightly browned. 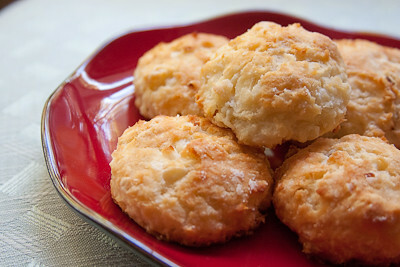 Biscuits are always best right out of the oven or still warm. However, these are also good at room temperature--the deep onion flavor is enough to compensate for whatever is lost, namely some fluffiness, when the biscuit cools. While unbaked biscuits can be frozen for up to 2 months and baked straight from the freezer, once the biscuits are baked, they're best eaten quickly. I hope you have a fabulous time at the class. I really enjoyed the Austin one. And Dorie was nice enough to sign my copy of BFMHTY as well as the new book. =) Your biscuits look great and sound delicious! Happy Birthday Dorie, and what a beautiful way to celebrate! Love your choice from Dories new book. Envious that you get to meet her! WOOT!! Have fun with Dorie today! The biscuits look soooo good! Nicely done Jaime. Me? Yes, I'm envious of you getting to spend time at the beautiful Central Market attending Dorie's event. Shucks you are so lucky! These look delicious, and how fun that you get to meet Dorie! Those biscuits look wonderful. I think all of her recipes are fabulous. Tell us what the class is like! Those beautiful biscuits caught my eye in AMFT also - it's hard to choose among all the fab recipes. Lucky you to be meeting Dorie today on her birthday. I hope to catch her in person one of these days. I don't mind onions at all, and this looks really yummy. Have fun at the event and wish her a happy birthday for all of us! Hooray...I hope you have a wonderful time in the class. It was so fun cooking for Dorie's bday with all of you! Jaime, it was wonderful to meet you today. Wasn't it fun to finally meet Dorie and also on her birthday? Your biscuits look perfectly tasty. Jaime, I was so happy to meet you today. Thank you for coming to my class and thank you so much for making my favorite biscuits for me. This has been an amazingly special day and I really appreciate your being part of it. Such a fun day in the blog world! Oooh I love the way these sound! I bet they're incredibly flavorful and, of course, everything Dorie does is awesome! The biscuits sound heavenly! YUM. My favorite bakery ever its called Saint Germain! and these look mouth watering! I need to bookmark it! Your biscuits look wonderful. What a great way to celebrate Dorie's birthday. I love savoury biscuits like these!